AD 262 --the Roman Imperium is in turmoil after the struggle for the throne that brought Gallienus to power. And Ephesus, the metropolis of the Eastern Empire, lies in ruins, shattered by a mighty earthquake. Its citizens live in fear as the mob overwhelms the city, baying for blood to avenge the gods who have punished them. Yet an even greater threat to the Empire advances from the North: the barbaric Goth tribes, determined to pillage the city. Only Ballista, Warrior of Rome, knows the ways of the barbarians, and only he can defeat them. 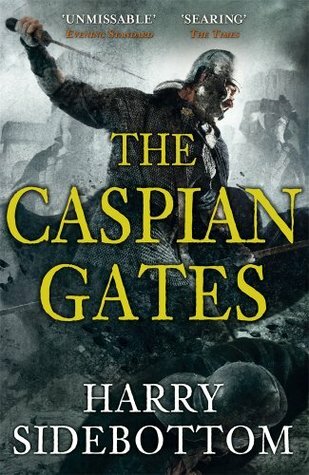 In a relentlessly gripping and richly authentic tale of ancient warfare, The Caspian Gates is an adventure for Rome enthusiasts and scholars alike. Widely acclaimed for his Warrior of Rome series, Harry Sidebottom "provides a well-constructed, well-paced, and gripping account . . . which, as a good series should, leaves the reader eagerly anticipating the next installment" (Times Literary Supplement). Book four in the Warrior of Rome series, The Caspian Gates is a complete and utter mess. I LOVED books 1-3! The sheer accomplishment of having written an engaging, educational historic novel, not to mention a series of them, is quite stunning. Harry Sidebottom's novels about Rome have been, until now, books I've been captivated by. If you, like me, adore all things (well, most things) ancient Rome, you should definitely check out these novels. But perhaps stop after book three because Sidebottom has completely side-stepped the thing that made the original books readable: a coherent plot. The Caspian Gates is completely flawed and disjointed. The main storyline revolves around main character Ballista's new assignment in the Caucus mountains. Except, before we arrive in the Caucus mountains, the entire storyline is sidetracked to Ephesus and the great earthquake that shook that city in AD 262. Seems interesting, right? I thought it would be, but the entire portion of the story in Ephesus is more like a short story than anything, not really fitting properly into the overall plot. It could really have been made into something interesting, and it would have been the perfect place to develop the family story between Ballista, his wife and sons even more (I LOVED that subplot in the last book), but ultimately, I was completely let down. I can't make up my mind whether the author wanted to write off a vacation/"research" trip to Turkey, justifying it by writing about Ephesus, or if the Caspian Gate portion of the story wasn't long enough and he needed more material, tossing in an irrelevant few chapters to pad the book length. Whatever the case, it doesn't work. Too many new characters who aren't developed enough. Too many beloved characters missing. Too much repetitive information about a morally bankrupt, disgusting, power-hungry emperor who can't make up his mind. Just too much of everything unimportant. Another bone I have to pick is with the insane amount of redundancy in describing matters of etiquette, etiquette that wasn't really used in the first three books, so it was really odd to introduce this "new" practice in the fourth volume (blowing kisses - everyone is flipping blowing kisses all over the place, it may have been historically correct, but it reads as ridiculousness). Lastly, in general, I really hate the shape the main character's character is taking on, or rather, dissolving into like spineless goo. I liked that the main Character, Ballista, was a man with moral grounding in the first three books. I don't want to read books about immoral people. It is one thing to be a moral person dealing with an immoral world, but another to become part of that world. Perhaps Ballista will come around in the next book, but he seems to have floundered in The Caspian Gates, so much so that I nearly don't want to risk reading another book about him. The verdict: Read Warrior of Rome, books 1-3. Skip book 4. Hope that Mr. Sidebottom pays more attention to writing book five and recovers his sense of direction and storytelling.